It's festival time again! Lots of pretty quilts to see, good stories to be shared. And the best of it all - no volcano interfering! I wanted to share two quilts I made that are close to my heart. These two string quilts are not living with me anymore, they were gifted to my oldest nephew and my oldest niece who both turned 15 this april / may. Proud and happy for them, I wanted to give them "a hug that lasts". This is their first quilts. Living in Norway, quilts are not that common, even if it is a growing interest in this great old craft. So these two quilts have strings attached, hart-strings. I really put my hart into making them. The quilts were started last spring, and I finished putting on the binding this spring. They are sewn on foundation muslin, and professionally quilted in a beautiful manner with harts / stars all over. The quilts measure about 60" * 75" and are intended to wrap these two lovely teenagers up in a warm hug! Enjoy more stories and great quilts on your virtual quilt show tour! 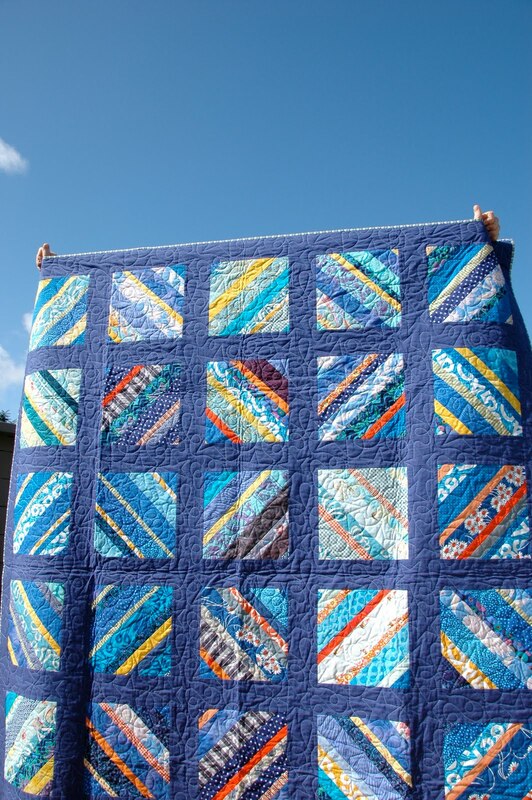 Great quilts - I love string quilts! Love them, Marit! Your fabric combos are perfect!! Wow, what a wonderful page..thanks for inviting me...I will link your Blog in my bloglist, feel free to do the same. I love them, they're so vibrant. Thank you for sharing them. What a wonderful gift for your niece and nephew! 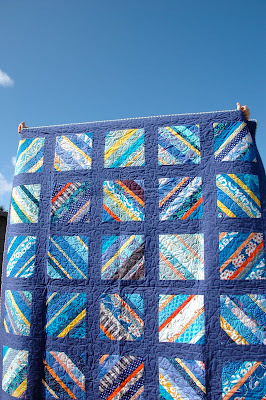 Great string quilts - on my list of quilts to make. Beautiful quilts. I love string quilts. Thanks for sharing these, and the story. Hy Marit, I love how you've broken up the strippy blocks with the dark blue - it looks really cool and a bit different. I love how you made these so colourful, quilts made with love cant be beaten! I love these quilts! I need to make one too! Stunning quilts. The colors are perfect. I love the red one! I must have a go at this design - so good for using up scraps! Two very beautiful quilts and what a nice story behind them. I bet the two kids are very proud of their quilts! What beautiful quilts ....the colors are fabulous !! And what amazing gifts that can be treasured for a life time. Those are both so fabby I can barely chose between them, much as I love red! :-) Such a great effect the design gives. What a great way to remind them of home. I love seeing the same quilt in two colorways. Really beautiful! Hey Marit, Two beautiful quilts! Thanks for sharing! Have a great weekend! wonderful quilts - I'm particularly fond of the red one. yummy! These are both really beautiful quilts! They're both fantastic! I'm a big fan of string quilts. The quilts you've shared are fantastic, Marit! Oh that red one makes my heart sing especially! I'll bet your niece and nephew love their hugs that last! "A hug that lasts..." I love it! String quilts are so special and your colors are wonderful! The quilt with the red sashing reminds me of the quilt that my grandma made me....she used the smae pattern too...the inside squares are made from clothing from family members, & she used red sashing as well. Love these quilts and the reason for them. Need to add a string quilt to my list. They are equally successful. Great! All I have to say is gorgeous. You raise string quilting to new heights. Beautiful! It's so intriguing to see them done in different colors. Your niece and nephew are lucky to have you. These are lovely! They'll be keeping those forever. Oh your neice and nephew are so lucky. Gorgeous quilts. 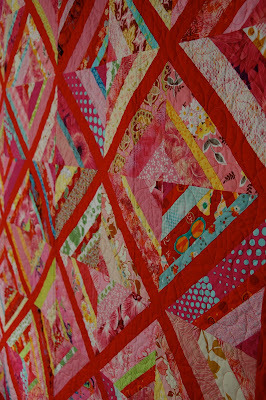 LOVE scrappy strippy quilts! String Quilts are sooooo affordable too! Sew On! Oh my goodness, I am in love with these two quilts! They turned out so beautifully. You did a great job with the color way. Great string quilts Marit- I love the rich colors that you chose- I am sure that your niece and nephew treasure them and feel the warm of your loved wrapped around them. Wow, wow, wow! These are gorgeous quilts! I love the sashing on a string quilt. What a great idea! These are so beautiful - it's so nice to wrap someone you love in a quilty hug! Both of these quilts are so beautiful (and timeless). As much as your niece and nephew enjoy them now, I'm sure as the years pass the will love them even more. Beautiful quilts! I want to make a string quilt so bad. Soon, very soon. Yours are super. I love them both. Very nice quilts! Lovely colourful quilty hugs! Well Done! Well said and done ! Lovely gifts from the heart. I love your string quilts. The colors are wonderful! 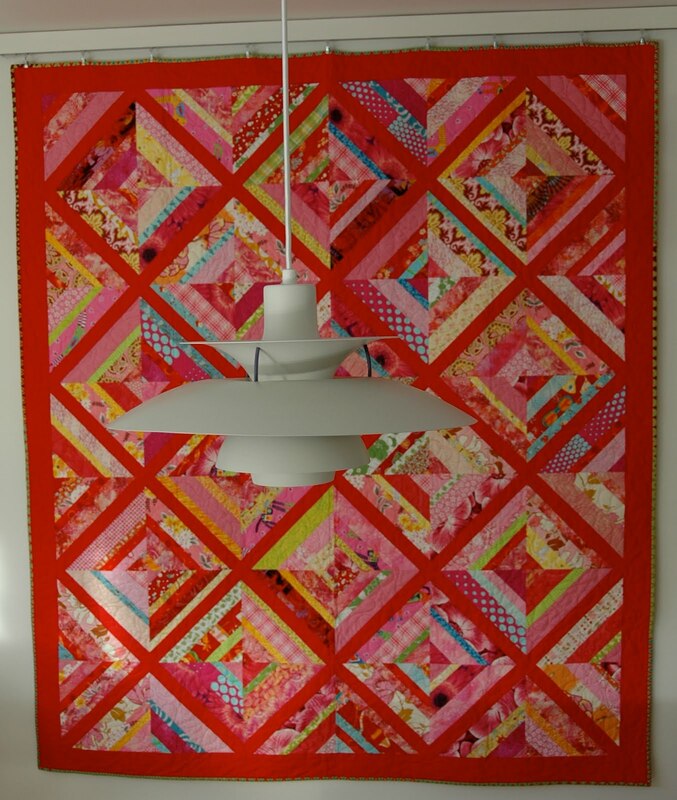 That red string quilt is FABULOUS! If it's in flickr, I'll be selecting that as a fave! Beautiful. I vote for the red one! Beautiful! These make me want to try a string quilt. Your niece and nephew are very lucky indeed. They are just gorgeous quilts. What wonderful gifts you have made. Love the colours you have used. So beautiful and inspiring for me to pull out mine that have been waiting for too long! Marit, they are both gorgeous! I must say that even though I love them both, I am partial to the red one. Love it! Those are both exquisite string quilts! Your niece and nephew are very lucky to have received such wonderful gifts! I love both of them - great fabric choices. That red one makes my heart sing! oh, your niece and nephew must really be happy with them. String quilts are favorites of mine. Yours are wonderful. Thanks for sharing! They are both gorgeous! I am sure they are cherished greatly. I love string quilts, and these are two very beautiful examples! What beautiful quilts, love them both! Your string quilts are gorgeous! What a beautiful pair - and what lucky kids to have such a generous aunt! Oh Marit, what a special gift for your niece and nephew! I love your string quilts...you did a wonderful job! They're both beautiful! I love the colors of both of these quilts - string quilts are wonderful. Thank you for sharing! But I have to admit - I was grinning from the moment I saw your header! Those two kitties are just adorable ... did they help with sewing your two string quilts??? they are both so bright and cheerful I'm sure the teenage's love them!! Love, Love, Love, String Quilts. Your quilts are gorgeous. Beautiful Marit! I love the colors and your choice of fabrics. I hope they are loving their quilts! They are both absolutely ebautiful. I wish I had your skill with combining fabrics like that. They're both beautiful; your eye for color is very good! I'm sure both teens are enjoying them immensely. Love the quilts and love the story behind them...I have a entered a version of a string quilt for my entry HERE. Both are beautiful, but that red one just makes me smile. It's very energizing! Very beautiful! What a lovely gift. I love those quilts! :) good job! Such cheerful quilts. Love the colors. You did a great job! Beautiful - I love string quilts too. I am sure I ahve enough scraps saved to make several. Both quilts are lovely, and I'm sure the new owners are loving them! lovely quilts and a lovely story to go along with them. my heart just sang when my granddaughter joyfully wrapper herself in the quild i'd made for her birthday last year. made all the effort worth it, so i know you've had that wonderful feeling also. Just wonderful string quilts. The children must love them. Magnificent! The colors really pop! Excellent quilts! I always like the look of string quilt blocks. love both of them! it's awesome how just slightly changing the layout can create such a different look to finished quilt. i can see why you are so attached to these beauties! What great string quilts, both look so warm and cozy. The colors of the pink string quilt are so warm and inviting. Beautiful work! I so love your pair of string quilts! lovely Marit! what a special gift to give your niece and nephew! I love your story about them too! I absolutely love the pieced pink quilt. Beautiful! Wow what wonderful gifts, your quilts are beautiful! Such beautiful quilts! What a wonderful hug - filled with warmth and much love. ; ) Thanks for sharing.